I've made my first contemporary quilt based on the techniques I learned in Nancy Crow's class. I have added a few other tips that I'll show you in this post. 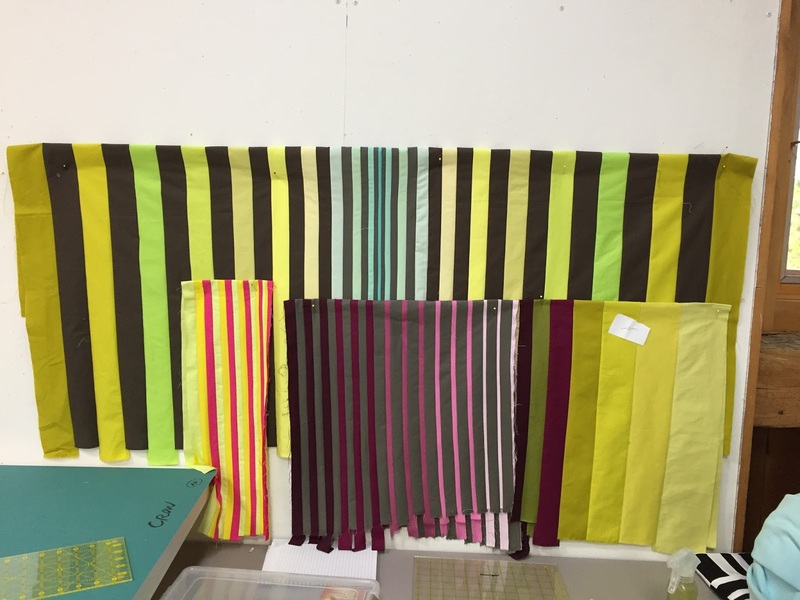 I made tons of strip pieced fabrics in the class, and the one that I liked the best by far was the largest and most time consuming. It took almost 5 hours to piece it, and it ended up being about 1-1/2 yards long. I also liked it because, of course, I put in a lot of my favorite color, which is lime green and it's neighbors. 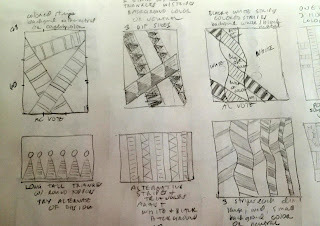 I originally cut two 8" pieces from this strip set and used them in columns in my class sample. But, I wasn't so sure about my wonky sewing in the class, and I thought that the top was too gaudy. 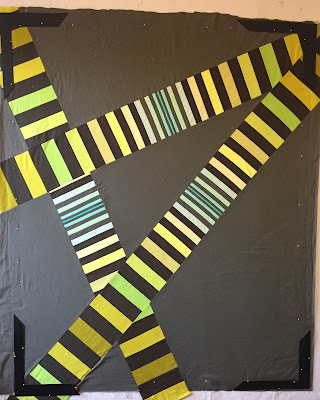 After I got home, I ripped out the stitching between the columns and released these pieces. 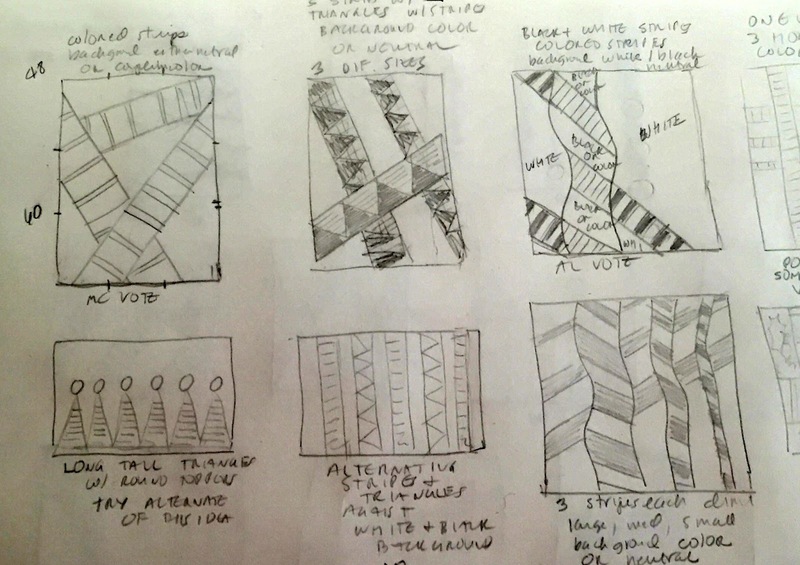 While watching TV one night, I quickly sketched up 30 designs that could utilize these strips. 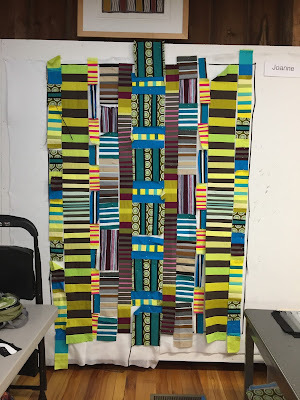 This is quilt #1 from my ideas and it uses only the strips from that huge piece. 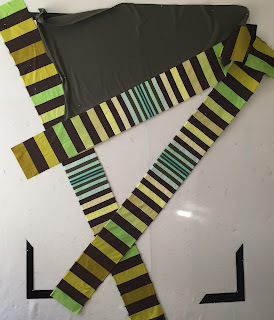 I laid out the edges of a 48" x 60" quilt on my design wall with 4 picture frame mat corners. (You can do this better as Nancy Crow suggested with 1/4" strips of black fabric.) Then I positioned the strips to closely match my sketch. This layout required lots of funny shapes for the background. So here's my tips on how to cut and sew these odd shapes. Drape the background fabric over the strips trying to line up the outside corners with the grain of the fabric. Pin 1" inside the overlap between the background and the strip. It is relatively easy to see the edge of the strips on a design wall, so place pins 1" from this line. Then take the background piece to your cutting table and mark the line, straightening it out with your longest ruler. Mark this line with a chalk pencil. Then cut it out on the lines. This gives you puzzle pieces with a generous seam allowance. Place these puzzle pieces of background back on the design wall. Note: leave plenty of extra fabric at the edges and don't try to cut them exactly to fit within the quilt perimeters. Sew the pieces to one side of one strip at a time with a walking foot. Then press and put back in place on the design wall. The walking foot helps to keep the edges of the strips nice and straight. A regular presser foot tends to push the top layer, so you might end up with stripes that look curved at the edges. Background pieces pinned in place. Y seams. Although it looks like there were lots of Y seams in this quilt, I didn't have to sew any. If you sew pieces of the quilt into larger chunks, similar to the method you might use for foundation piecing, you will just be sewing straight lines. 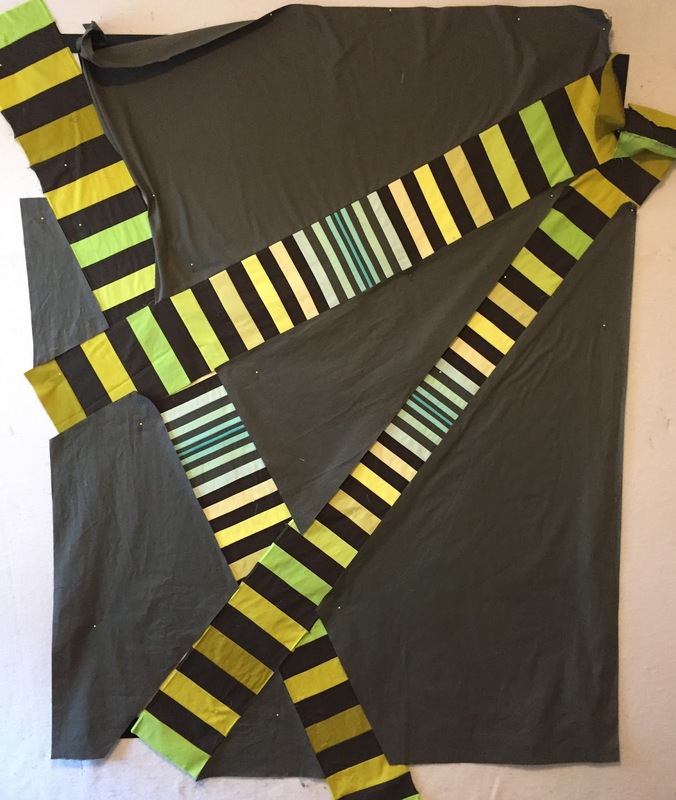 In this quilt, there were 4 major construction lines running from left to right (somewhat horizontally), and each of those was broken down into 2 minor seams from top to bottom (somewhat vertically). Where the strips overlapped, I cut the bottom one down the middle so that I would be able to avoid the Y seams. 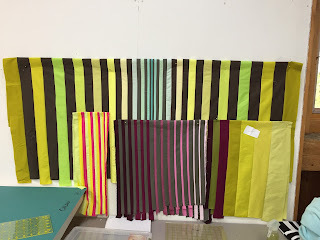 After all of the 3 chunks are sewn and placed back on the design wall, use a long ruler to line up the somewhat vertical strip edges. Then, using a chalk pencil, lightly draw the edge of the strip on the background fabric where it meets the somewhat horizontal strip. Turn under 1/4" on the strips and line this up 1/4" away from your drawn line. Pin very near to the edge of the fold. Take your top to your large table. Carefully flip right sides together and re-pin. Only do one seam at a time! Press the seam, trim if necessary, and put back on the design wall. Make sure to keep smoothing it out so you won't end up with tucks. Then systematically sew all the pieces together, making sure that you're keeping your piece flat and aligned. It helps tremendously to use your design wall or large design table to get this right. 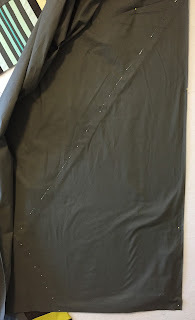 You can take tucks later if you have to, but you can avoid most of them if you carefully sew, press, smooth out, and mark the next seam. Using your corners or black strips, remeasure for the size of the quilt you want and cut off all the outside edges leaving 2" overhang. Note: You can cut your quilt to any size at this point, and it may end up slightly smaller or slightly larger than you originally intended. The 2" overhang is to help quilt to the edges, and have enough to turn to the backside for the facing finish. I plan to quilt this in the contemporary style of straight stitches down the whole piece, leaving a scant 1/4" between the rows. That will take some time, but will look very modern when it's done. I hope you like it and can use the tips!